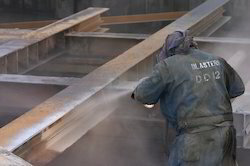 We are one of the leading service providers of Grit Shot Blasting work to our customer. Our range of services is done by a organization of expert professionals, which meet the international standards. We bring forth our vast industrial experience and expertise in this business, involved in providing Sand Shot Blasting Service. Being quality-centric firm, we are occupied in presenting a high-quality range of Shot Blasting Services On Beer Glass . We assure our clientele the on-time delivery at nominal costs. We are work for all type of Shot/sand blasting Work. We Have all Instrument in use Blasting work. We are rendering Inhouse Shot Blasting And Painting Service to our patrons. Due to prompt completion, our offered service is extremely admired in the market. Our service meets on client’s demand. Moreover, we render this service as per patron’s demand. We hold expertise in carrying out Shot Blasting Services, which removes metal scale and cleans the surface of parts to give them a uniformed and clean finish. The process helps in making the final product ready for painting or additional processing. We have the requisite manpower and facilities, which allow us to undertake our work with utmost precision. We are into the manufacturing of reactors that serve diverse industrial requirements, specially used for chemical and pharmaceutical industries. These industrial reactors are fabricated to accuracy using qualitative material. These industrial reactors are to our clients at industry leading prices. On customer specification, to give more better aesthetic appearance to the castings, jobs are shot-blasted with aluminum oxide shots. The 6 mtr x 4 mtr x 4.5 mtr size. Booth is erected for close shot blasting. The G 17 size spherical metal Grits are used for shot blasting, to achieve best result. All jobs are performed as per IS Code..
Stratablast™ is one of the principal "Blast Based Services" offers that has the potential to bring about a revolution in current mining practise in open pit coalmines.